I’ve mentioned WP Migrate DB in previous posts, but it’s been at least two years since I’ve last written about it. In two years, software can change a lot and WP Migrate DB is no different. I’m still a fan, I still recommend it to people, and I still think that it’s an extremely valuable plugin for any WordPress developer (or even someone who works with WordPress site migrations) to have available. The point, though, is not for me to sit here and promote a plugin or to try to push something on you. I’ve said what I need to say in terms of who needs it. But for those who are skeptical or those who are just getting started in WordPress development, it still raises a question as to why anyone needs it. And that requires an understanding of why each person should have various environments setup for their project development. If you’re an seasoned developer, this post isn’t for you. 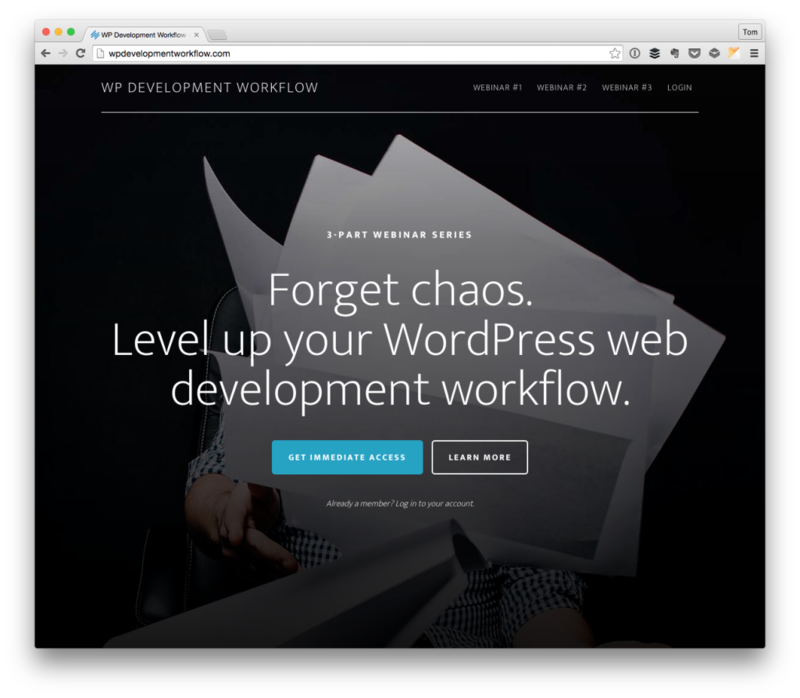 But if you’re getting started with WordPress development or looking to refine your workflow, then follow along. I’ll make this quick. The biggest advantage the plugin gives you, as someone who’s building things for others using WordPress, is the ease at which you can transfer data from your environments (including your uploads) should you need to be able to do so. This makes deployments so much easier than having to manually script moving databases from one location to another. But if you don’t have any kind of workflow setup, then I highly recommend looking into getting one setup – I’ll talk about this more in a bit. Above all else, you need to have at least three environments with which you’re working. Development refers to the machine on which you’re doing your development. This includes an installation of WordPress, the plugins, themes, and files you’re working on, as well as a way to check the code into version control. Staging is an environment mirroring Development allowing you to push code to it either automatically via a deployment tool or via S/FTP. This is meant for the client to see, to test, and to hammer on while the product is under development. Production is where the final version of the project actually lives. No development happens here and this is where the real information resides. This is where code is pushed after it’s undergone development and passed QA. I’ve talked about this in much more length in other posts, so if you’re curious about those details, then you can read more about them. So where does a database plugin come down into all of this? Migrating source code and WordPress from environment to environment is easy. You can use a deployment tool like DeployBot or Codeship without any problems. But what if you’re piping a lot of information into the Development database you want available on Staging or vice versa? Then you’ve got to go through this entire process of exporting and importing an SQL file. That’s where WP Migrate DB comes in: You install the plugin on your local machine and you install the plugin on Staging. From there, you can push and pull data from Development and Staging from within WordPress. Literally, the amount of time this single plugin has saved will yield a return on its purchase in a single project. 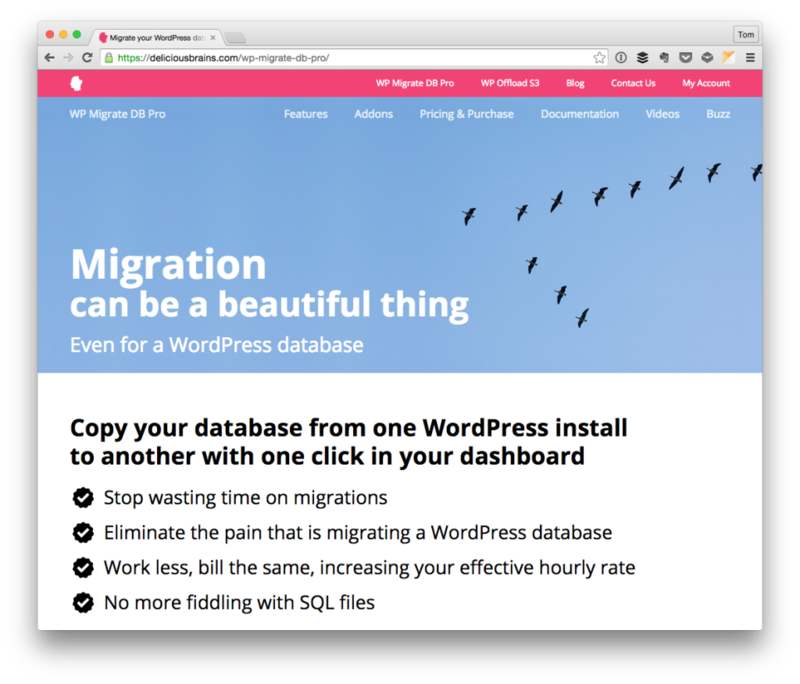 This post is meant nothing more than some of my personal thoughts on WP Migrate DB, why I like it, and why I think anyone working with WordPress in a professional capacity should be using it. But if you’re looking to build out your own development workflow, a single plugin is not going to cut it. I know people are eager to learn both development and how to setup workflows that work great for them. I’ve already covered the WordPress Developer’s Club which is great if you’re looking to get into software development and/or engineering. But what if you’re looking for various workflows to improve your already-established way of getting your stuff done? In that case, you may be interested in WP Development Workflows with Carrie Dils and Mika Ipstein. This may read more like a commercial rather than a recommendation, but it’s not – the short of it is that these are two experienced WordPress developers who are working to help people level up how they work with WordPress. But in the meantime, Carrie and Mika’s isn’t a bad series place to start if you’re looking to up your game a bit. Neither is using a database migration plugin. I am Big fan of wp migrate db plugin, Most of time we use this plugin. We can host our site local to live just in 15 m. When i am not familiar with this plugin then we used one PHP script for replace old URL to New URL. The last big obstacle in this workflow is moving the database with a live site that’s constantly registering changes you’ll overwrite if you just import everything from staging. Any thoughts about VersionPress as a solution for that? It’s close to a release that will synchronize live to staging databases and handle merge conflicts. I just skimmed by a note in Post Status that says merge is coming to WPMDBP too; good news! Personally, I don’t have any thing to offer as I’ve not used VersionPress. I have setup a workflow where we sync the staging and productions databases back and forth as needed, but not in a situation like you’re talking about. It’s normally for new sites and/or projects. I wish I had more to offer. Perhaps someone else will. If hyperbole were ranked on a ten-point scale, this quote would be a – 37. The time-saving value of this plugin cannot be overstated.